"Nobel Peace Prize nominee PFC Bradley Manning, a 25-year-old Army intelligence analyst, who released the Collateral Murder video, that shows the killing of unarmed civilians and two Reuters journalists, by a US Apache helicopter crew in Iraq. Manning also shared documents known as the Afghan War Diary, the Iraq War Logs, and series of embarrassing US diplomatic cables. These documents were published by the anti-secrecy website WikiLeaks, and they have illuminated such issues as the true number and cause of civilian casualties in Iraq, along with a number of human rights abuses by U.S.-funded contractors and foreign militaries, and the role that spying and bribes play in international diplomacy. Given the war crimes exposed by these documents, PFC Bradley Manning should be given a medal of honor. Soldiers are promised fair treatment and a speedy trial under the Uniform Code of Military Justice (UCMJ). However, the soldiers responsible for PFC Manning’s care took it upon themselves to abuse him by keeping him locked up in solitary confinement for the first 10 months of his incarceration. During this time, Bradley was denied meaningful exercise, social interaction, sunlight, and on a number of occasions he was forced to stay completely naked. These conditions were unique to Bradley and are illegal even under US military law, as they amount to extreme pre-trial punishment. In March 2011, chief US State Department spokesperson PJ Crowley called PFC Manning’s treatment at the Quantico, Virginia, Marine Corps brig “ridiculous and counterproductive and stupid.” He was forced to resign shortly after admitting this. Since resigning, he has stated that the prosecution’s heavy-handed persecution of PFC Manning has undermined the government’s credibility. It only took one week in April 2011 to have over a half million people sign a petition calling on President Obama to end the isolation and torture of Bradley Manning. The Obama administration’s ongoing persecution of Bradley Manning has served as “a chilling deterrent to other potential whistleblowers committed to public integrity,” and over 300 top legal scholars have declared that Bradley’s treatment was a violation of the Eighth Amendment’s prohibition against cruel and unusual punishment, as well as a violation of the Fifth Amendment’s guarantee against punishment without trial. Among the signatories is professor Laurence Tribe, a Harvard professor who taught President Obama. Professor Tribe was, until recently, a senior advisor to the US Justice Department. Partially in response to public outcry, on April 21, 2011, Bradley was moved from Quantico to Fort Leavenworth, KS, where his conditions greatly improved. The very day he was moved, President Obama was surprised at a breakfast fundraiser by a group of protesters. At the end of the fundraiser, a member of the Bradley Manning Support Network, Logan Price, questioned him about Bradley’s situation. The President stated that “He [Bradley Manning] broke the law.” This pretrial declaration of guilt that has caused concern among legal experts, who argue it is clearly a case of ‘undue command influence’. President Obama is the highest ranking military commander, and soldiers follow his orders and his direction. By declaring PFC Bradley Manning guilty, he set the tone and direction of the subordinate military prosecution. It is now difficult for soldiers to express support for PFC Bradley Manning, who like many soldiers who follow the lead of their commander-in-chief, assume PFC Bradley Manning is guilty. Finally, reinforcing the assumption of Manning’s guilt, no charges were filed against any of the soldiers who took it upon themselves to abuse Bradley while he was under their supervision. Bradley Manning has a growing list of supporters who want all the charges against him dropped. Among the supporters is the famous whistle-blower, Daniel Ellsberg, who leaked the Pentagon Papers in 1971. Recognizing the valor required to tell the truth, Ellsberg calls PFC Bradley Manning a hero and a patriot. We agree. Drop all the charges, and free PFC Bradley Manning. We hope that you will join us as well. See what you can do to support justice in this historic time." 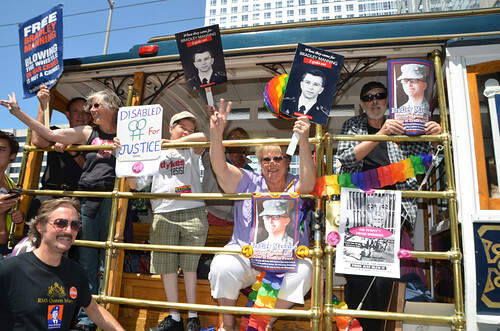 This entry was posted in Exercise and tagged 2013/06/30, Bradley, FREE, Manning, Parade, Pride. Bookmark the permalink.